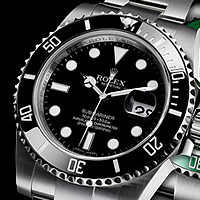 Rolex has reworked its Oyster Perpetual Submariner Date and changed its reference number to 116610. While the case of the watch remains 40mm in diameter the profile is noticeably squarer and has thicker lugs. 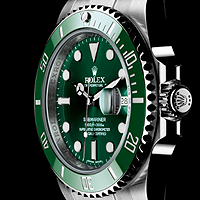 Also changed is the graduated unidirectional bezel, which now lacks the anodized black aluminum insert, replaced by the Cerachrom bezel, manufactured from a special ceramic material that Rolex has developed in-house. Chosen for its immunity to UV damage and saltwater corrosion and its being being extremely resistant to scratches. The dial has enlarged luminous hands and hour markers treated with Chromalight for easier readability, this material has a distinctive blue glow which is more visible to the human eye even in underwater conditions. The bracelet has been updated as well, the stainless steel Oyster bracelet no longer has the brushed center links but a solid link. The clasp latches with a complex spring-loaded mechanism and has a precise Glidelock extension device with a ratchet. The retail price for the new 116610 Submariner Date is $7,250. There is also the 116610 LV version, which features a green Cerachrom rotating bezel, and a matching metallic dial in green gold which will retail for $7,750.